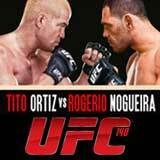 Review: 2011-12-10, good fight and pace between Tito Ortiz and Antonio Rogerio Nogueira: three stars. Tito Ortiz (16-9-1) entered as the No.11 light heavyweight in the world while Antonio Rogerio Nogueira (19-5-0) entered as the No.22. Ortiz vs Nogueira is on the undercard of Jon Jones vs Lyoto Machida (UFC 140). Watch the video!